Average Weight	: 55 - 75 lbs. The Black and Tan Coonhound was initially developed by crossing the Talbot Hound (now extinct) with the Bloodhound and black and tan Foxhound brought to this country by the English settlers. 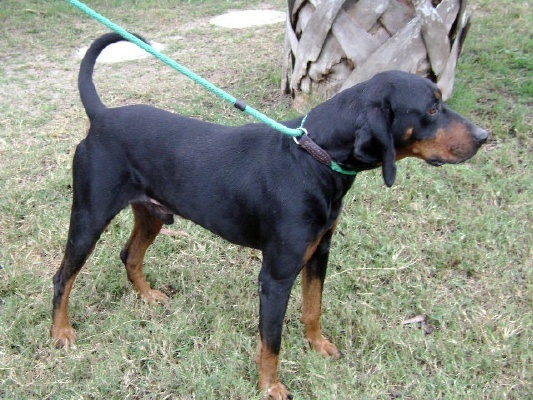 The Black and Tan Coonhound was the first coonhound to be considered a separate breed from the Foxhound. The Black and Tan was best known for its use in trailing and treeing raccoon, howling at his quarry. Their purpose was to hunt racoons, opossums and bears. It's origins can be dated back to the 1700's. They were bred to have the scenting abilities of the Bloodhound but the ability to travel at at faster pace and they were also suited to night hunting. Coonhounds are built for endurance and are able to travel across rugged, mountainous regions. In fact, the breed was developed by the people who lived in the Appalachian, Blue Ridge, Ozark and Smoky mountains. When the prey is the dogs bay, alerting the hunter, who then arrives and shoots the animal. The Black and Tan Coonhound was selectively bred for their color - there are many other types of coonhounds including Blue Tick Coonhounds, Redbone Coonhounds, English Coonhounds, Plott hounds and Treeing Walkers. This working coonhound has very successfully been used to hunt other types of game such as bear, stag, opossum, deer and mountain lion, even on difficult terrain. They withstand the rigors of winter as well as intense heat. There is not much you can do to change the Coonhound's temperament, pretty consistant in how it interacts with people, this breed is pretty easy going and friendly. As any other hound, scent is what makes this animal move. In order to get the best that this breed has to offer, it is important for this dog to be around other hounds, preferable older and experienced dogs. Being of great disposition, the Coonhound is a dog very safe to have around. An agressive behavior is not a normal characteristic for this breed. It is mostly tolerant, independent, gentle, stubborn and sensitive. Being very sociable, it enjoys the company of other dogs and humans. Because of it's stamina, the Coonhound can be unfit as a pet unless greats amount of exercise and enough space to roam. Restricting this animal will cause serious behavior problems. Most common Health Problems for this breed are in relation to the Bones, Joints, Muscles, Nerves, Ears, Eyes, Teeth and the Mouth. Hounds often suffer from Cataracts as well, which can be treated in our days. An occasional brushing is all that takes. However, regular attention should be paid to the ears and eyes to keep them healthy. It requires a substantial amount of exercise and a fenced yard. Behavior will be greatly affected if the animal is not provided with distraction. Coonhounds have a reputation for being difficult to train. However, training a coonhound is not hard as some think, if you go about it the right way. Most coonhounds are very food oriented and will do almost anything for a treat. Due to their affectionate, social personality, if you don't train your hound you will have created a monster(jumping up or putting their noses into inappropriate places). They can become easily distracted as training is taking place. Any different scent will get the off track and getting them back into the mood can take sometime. Patience is a must in training this breed, any form of physical punishment to force them into learning will not work and only confuse the animal because it will not know what is doing wrong. This breed is for the experienced owner. Many of these dogs become a problem for lack of proper exercise and training. A lot of them are found in dog pounds. Personal situation - time available and medical conditions such as allergies, asthma or back pain. Living Conditions for the breed of your choice. Family - child suitability, other pet suitabilities. It seems like many times parents, grandparents and other relatives or friends in order to please a child will give them a puppy. There might be a great problem in giving a child a Black and Tan Coonhound puppy. Larger breeds usually grow very fast and in no time that cute small puppy will be bigger, much bigger than your 8 year old. The size of puppies are naturally considerably smaller and the full grown size of the animal can easily be forgotten when confronted with cute puppies! The slogan " A dog isn't just for Christmas - it's for life!" was necessitated by well meaning people buying puppies at the Christmas, unaware of the puppies growth rate. The pictures provided make it extremely clear exactly how small puppies will develop and whether it will suit the life and living conditions of the family. **Age comparison between Breeds and Humans. Comparisons between dogs and humans are always a matter of debate - we hope that the following information clarifies the situation. After the first year of life, a dog is equivalent to sixteen human years. After two years, they are equivalent to a 24 year old, at three years a 30 year old, and each year after, add 5 human years to determine a dog's age.